Chimaza passed his newborn hearing screening, but at 20 months he wasn’t talking. Concerned, his mother, Christiana, had her son evaluated for speech and language services. At 23 months, Chimaza was diagnosed with a profound hearing loss. At 24 months, he was fitted with hearing aids. When Christiana enrolled him in Clarke New York’s Early Intervention Program shortly thereafter, Chimaza had no language, no awareness of sound, and limited ability to control his own behavior. The teachers and therapists at Clarke immediately began working with mother and son, helping Christiana to understand Chimaza’s hearing loss and teaching her little boy how to use his hearing aids to make meaning of sounds he was hearing for the first time. 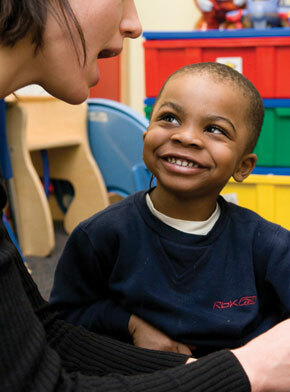 Just before he turned three, Chimaza received a cochlear implant and soon after, entered Clarke’s Preschool Program. There, Chimaza quickly progressed from learning to listen to listening to learn. The close collaboration between Christiana and Clarke’s staff, combined with Chimaza’s own hard work, yielded amazing results: within his first three months in preschool, Chimaza’s listening and spoken language skills advanced the equivalent of six to eight months! Moreover, as Chimaza’s skill levels were dramatically increasing, his teachers and therapists witnessed a significant decrease in his behavioral problems.